In July 1909 police in London informed the organizers of an anti-vivisection protest that they could not use two of the banners made for this event. In both cases the images on the banners showed a dog being subjected to experimentation. The organizers made sure to point out that these images had been taken directly from publications which promoted animal experimentation. In other words, the organizers of the protest felt that it was important to underscore the fact that these images were not fabricated representations but, rather, were adapted directly from vivisection material. There was “no exaggeration” in these images stressed Louise (“Lizzy”) Lind af Hageby, the organizer of the International Anti-Vivisection and Animal Protection Congress, a multi-day event which included this high-profile public demonstration through the streets of London on Saturday, July 10, 1909. This image was reproduced on one of the prohibited banners for the July 1909 procession. In the end, the police’s decision to prohibit these banners was upheld. However, as a protest to this ruling, one of the forbidden banners was draped with another piece of cloth to hide the offending image, and the resulting blank banner was carried defiantly at the end of the procession. I find this to be such a fascinating example of the role of visual culture in the animal advocacy movement from this time period! Images can, of course, draw attention to important issues, but imagine the power that this blank banner had in this context. The absence of imagery here was likely as powerful as any pictorial banner in the procession – perhaps even more so. As one eye-witness pointed out, if an image is deemed to “be of such revolting character that it cannot be carried through the streets,” then isn’t this a powerful argument against the action being depicted? As I often remind my students, when it comes to visual culture it is important to remember that what is excluded is often as significant as what is included. In this case, the blank banner was a bold statement against both vivisection and censorship, and certainly a clever use of visual culture by Lind af Hageby and her colleagues. Lind af Hageby is the woman in the centre of the front row in this picture. The other women in this photograph are: Mrs. Clinton Pichney Farrell, Mrs. L.B. Henderson, Mrs. Florence Pell Waring, Mrs. Caroline E. White, and Mrs. R.G. Ingersol. *I discuss this event as well as the use of visual culture in other animal advocacy campaigns from this time period in my new book, Art for Animals. *This post has also been shared on The Unbound Project website. “The Anti-Vivisection Procession” The Times (July 8, 1909), 3. “Prohibited Banners” The Standard (July 3, 1909), 8. “Anti-Vivisection Processions” The Times (July 9, 1909), 4. “The Anti-Vivisection Agitation” Saturday Review of Politics, Art, Literature, Science and Art (July 17, 1909), 83. One thing I am normally doing at this time of year is finalizing my spring/summer travel plans – ’tis the season for for research trips and conferences! However, this year I plan to spend most of my spring/summer here at home in Niagara. There are many reasons for this – we are getting some much-needed major renovations done to our home. Also, we live in a pretty excellent part of the country for kayaking adventures, and I certainly hope to be doing a lot of paddling in the coming months. I also have been dealing with some rather mysterious health issues lately. It has been incredibly frustrating and stressful, and we are still trying to get to the bottom of all of it. I feel like it is important to stay close to home right now as we are working this out. In terms of my research and writing, the book I have been working on for the past decade will be out later this month. (Yay!) This project has been such a big part of my life for so long, and it feels a bit weird to not be actively working on it any more. I still have tons of material that didn’t make it in to the book – my archival explorations turned up much more information than I’d ever imagined I would find about how animal advocacy groups in the late 19th and early 20th centuries used art and visual culture. I certainly have more writing to do on this front, but I’m also thinking about new avenues and directions for my research – related avenues, but they would be spin-off projects that require me to dig in and do some reading. I have, therefore, decided that my research focus this summer will simply be reading. I know I will feel like I need to be doing more than reading, but I’m going to try to quiet that part of my brain. Sure, sitting on my front porch reading a pile of books isn’t quite as exciting as being at the British Library, but it is what I need to be doing right now. I’m looking forward to it! I’m surprised at how many people have asked me what my next book will be about — my latest isn’t even out yet! I’m going to draw on the wisdom of my colleague Dr. Barbara Seeber who, along with Dr. Maggie Berg, wrote the wonderful book, The Slow Professor. One of the main points they make in this book is that the scholarly work we do requires time – we need to spend time reading carefully, thinking, making notes, etc. I am not going to give in to the pressure to get the prospectus for my next book project whipped together in record time. I really feel that right now I need to immerse myself in the literature related to some of these new avenues I want to be exploring. I need to slow down, to read, to think, to figure out the next steps. I’m excited about the #summerofreading – I think it is just what I need right now. Some of the books I want to read this summer. Being an advocate for animals can be a challenging task. It is very difficult to so be acutely aware of the many ways in which animals are exploited and harmed in our contemporary world because we are surrounded by reminders of just how ubiquitous this cruelty is. Take, for example, a holiday meal with friends and family where a meat dish is the centrepiece–where others may see a tasty treat, an animal welfare/rights/liberation activist may see a visceral reminder of suffering and death. To be constantly faced with these material reminders of the ways in which animals are (mis)treated in our society can certainly take an emotional toll. Recently there have been a number of articles offering tips on how to avoid compassion fatigue, activist burnout and how to combat the depression that often goes hand-in-hand with caring deeply for those who are suffering. As I read these articles I can not help but think of Marie-Françoise (“Fanny”) Bernard (née Martin) who was married to Claude Bernard, a 19th century French physiologist best known for his experiments on animals. Claude Bernard was often the focus of public anti-vivisection campaigns conducted by people like Frances Power Cobbe, but this tension also played out within his domestic life. Fanny Martin detested her husband’s experiments on animals, many of which he conducted at home. To add insult to injury, the dowry paid by her father at the time of the marriage in 1845 helped to fund many of Bernard’s experiments on animals. Perhaps as a way to attempt to make amends for her husband’s treatment of animals in his laboratory, Fanny Martin and her two daughters established a “rescue home” for stray dogs and cats. They also attended anti-vivisection protests and volunteered with the Société protectrice des animaux. Finally, in 1870 the couple legally separated, no easy task for Catholics in 19th century France! I propose we change this dialogue and remember Fanny Martin for her courage, bravery, and her uncompromising empathy for animals. May she serve as an inspiration for those continuing to stand up against cruelty to animals. * Deborah Rudacille, The Scalpel and the Butterfly: The War Between Animal Research and Animal Protection (New York: Farrar, Straus and Giroux, 2000): 19. **This post was also published on the Unbound Project website. As the weather starts to turn colder, many of us are thinking about getting a new winter coat. I love that there are so many cruelty-free fashions to pick from! Imagine my delight, then, when during the course of my research I learned about a woman who was making cruelty-free alternatives to fur coats, silk scarves, and “kid” gloves over 100 years ago! Her name was Maude (“Emarel”) Freshel, and she was the co-founder of an organization known as the Millennium Guild. The Guild advocated for a lifestyle that included a vegetarian diet and hosted lavish meat-free Thanksgiving dinners in Boston in the early years of the 20th century. The sale of the cruelty-free outerwear that Freshel sewed helped to fund the activities of the Guild. A number of these fashions were featured in the Boston Sunday Post on November 17, 1912. 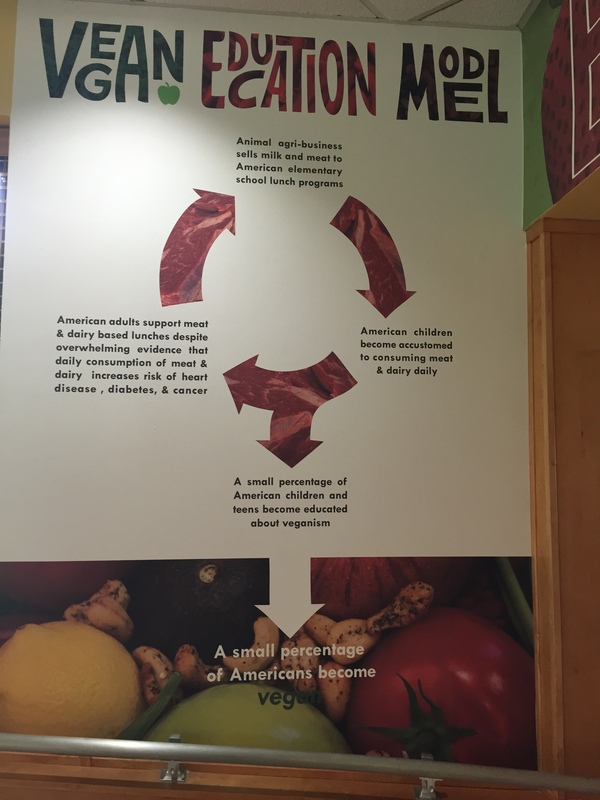 Freshel was also the author of The Golden Rule Cookbook, a vegetarian cookbook promoting the abstention from meat eating for ethical reasons. Freshel defined a vegetarian (remember, the term “vegan” didn’t exist until 1944) as someone who “for one reason or another condemns the eating of flesh.” She saw this as occupying “a very different place in the world of ethics from one who is simply refraining from meat eating in an effort to cure bodily ills.” Freshel’s dog, a terrier named Sister, was also a vegetarian and reportedly enjoyed such foods as lentils, peas, apples, oatmeal, and buttered toast. I can’t believe it is mid-April! The weeks have been flying by. I’ve been working away on the book manuscript, but I also have been doing some travelling. First I went to the 2nd instalment of the “Living With Animals” conference at Eastern Kentucky University. I went to this conference two years ago, the first time it was held, and just loved it. It was such a great mix of people–a truly interdisciplinary gathering of people who shared common interests. The second version of the conference was just as good. I heard some excellent papers and especially enjoyed hearing Julia Schlosser’s keynote presentation about her artwork. One of the things I really like about this conference is that there is a good amount of the program dedicated to teaching animal studies, so there were great presentations about pedagogy (I especially liked Jeannette Vaught’s presentation called “Animal Infiltrations: Teaching Animal Studies in Traditional Courses”) and a roundtable discussion focusing on ideas for setting up animal studies courses and programs (both Human-Animal Studies and Critical Animal Studies) at the post-secondary level. As was the case two years ago, we had some excellent discussions! I also travelled down to Denton, Texas to attend the “Moral Cultures of Food” conference at the University of North Texas. When I saw the call for papers for this conference I knew it was one I wanted to go to. 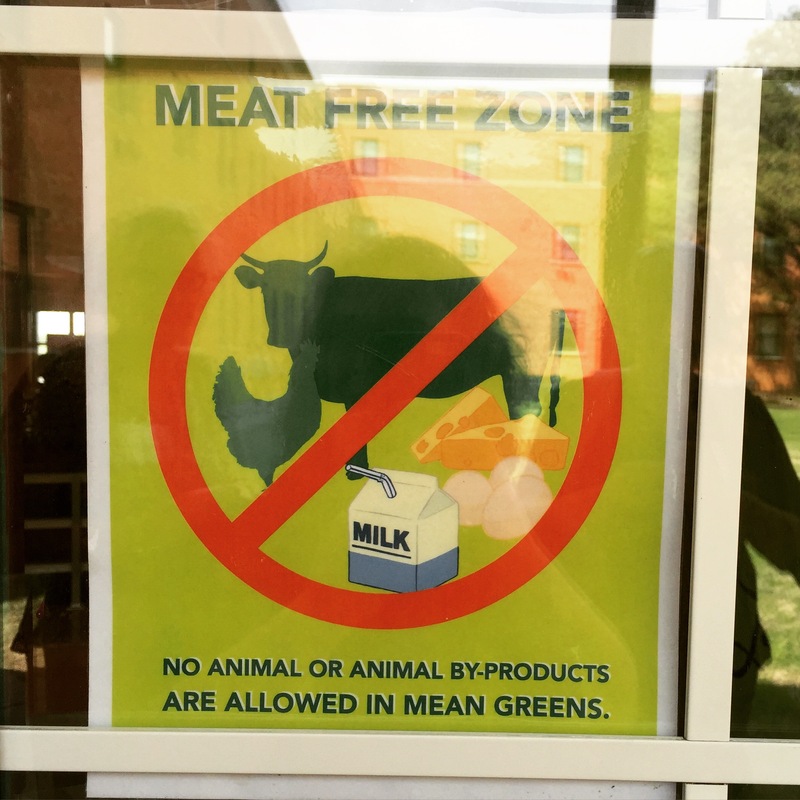 Not only did the topic appeal to me and relate to my current project, but I also knew that the University of North Texas was home to “Mean Greens,” the first all vegan dining hall. Ever since I first heard about Mean Greens I was trying to find an excuse to go to UNT, so this seemed like a conference I had to attend! The conference was great and, like the “Living With Animals” conference, it featured scholars from a wide range of disciplinary backgrounds. I had the honour of being Carol Adams’s houseguest while I was in Texas, and it was there I discovered the recipe for the world’s most delicious vegan mac and cheese recipe. Honestly. This stuff is out of this world. It is a recipe that Carol veganized from a cookbook that her family used. She promises to do a blog post with the recipe, so I don’t feel comfortable sharing it here, but keep an eye out for it on her site. [Update: here is the recipe!] It is so ridiculously good. I’ve made it twice since returning home. In fact, all the food she served was incredible–she even cooked up a full vegan version of a Texas barbecue. Amazing! And speaking of amazing food in Texas, “Mean Greens” at UNT absolutely exceeded my expectations. 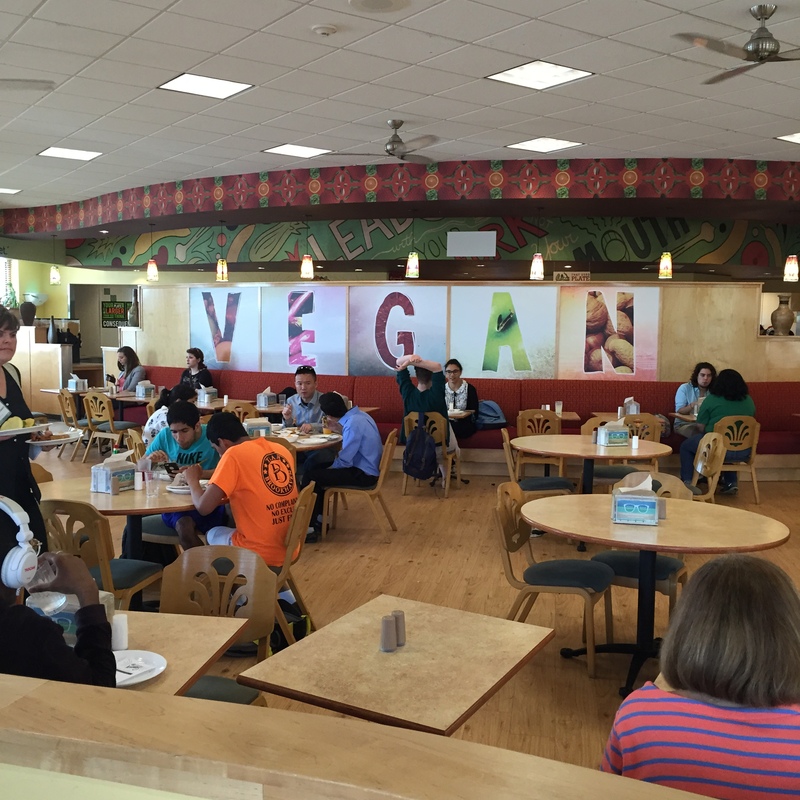 I was excited about the fact that there was such a thing as a vegan dining hall on a university campus. I hadn’t stopped to think much about what precisely that would mean, but figured it was the novelty of the experience, not necessarily the quality of the food that I was going for. Let me tell you, the food was incredible! And it was really affordable too! I went with a group of conference attendees at lunch and it was $7.50 for as much food as you wanted to eat. There was a breakfast bar, hot dishes, a salad bar, a dessert tray, and even a ice cream sundae bar. And the food was really, really good! I also loved the environment. It was bright and cheery, and had quotes about veganism and compassion for all species painted on the walls of the dining room. There was even a sign on the door declaring it an “meat free zone.” This was full on, unapologetic veganism gone mainstream, and the place was packed! 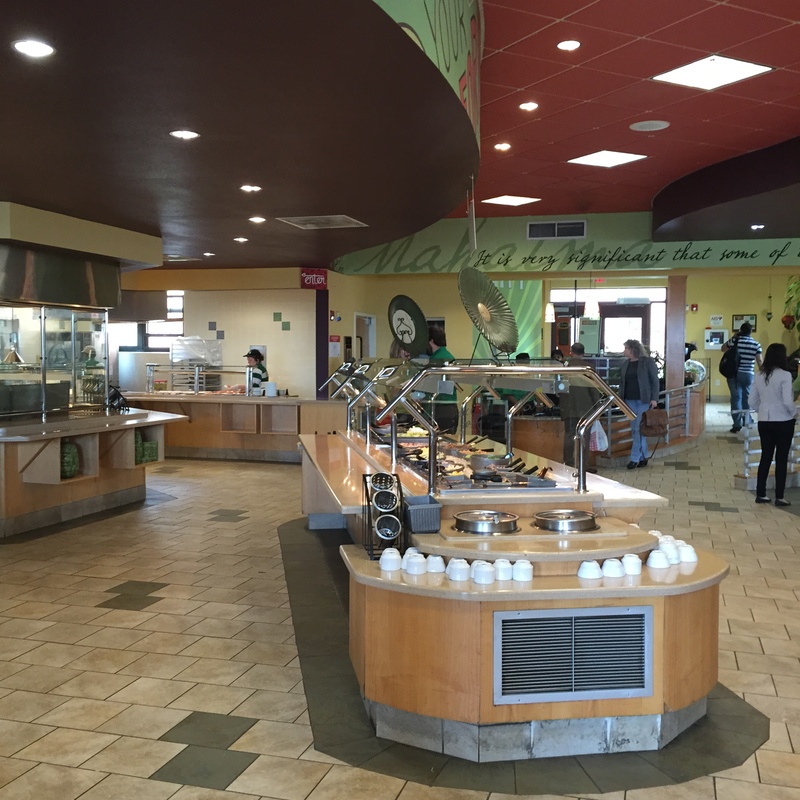 We even got to talk to one of the chefs who told us how popular the initiative has been and how it is, in fact, saving UNT money when compared to other meal options. I hope to see more campuses following this lead! 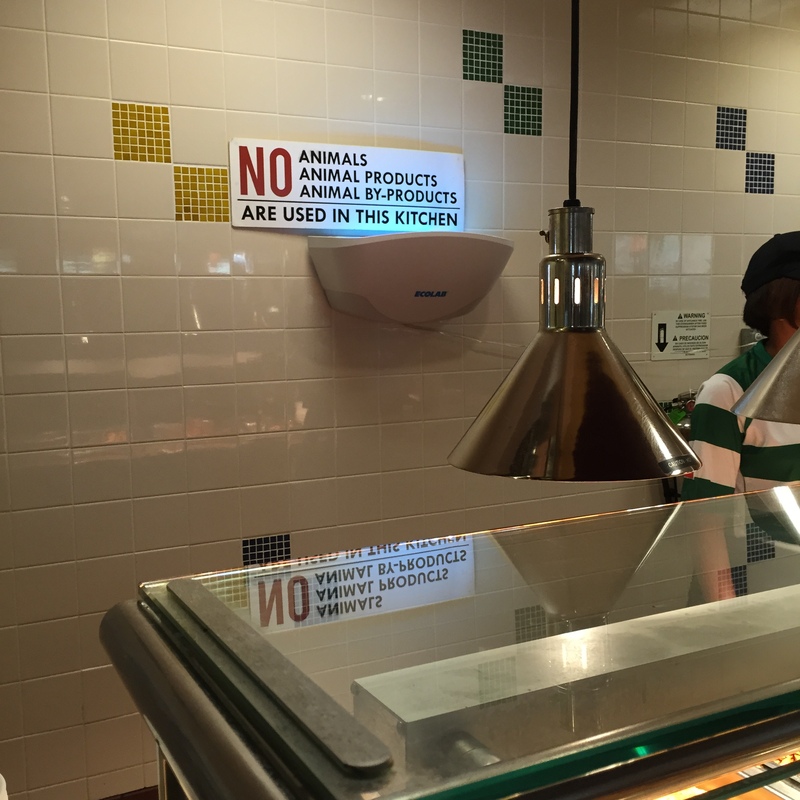 No animal products used in this kitchen! 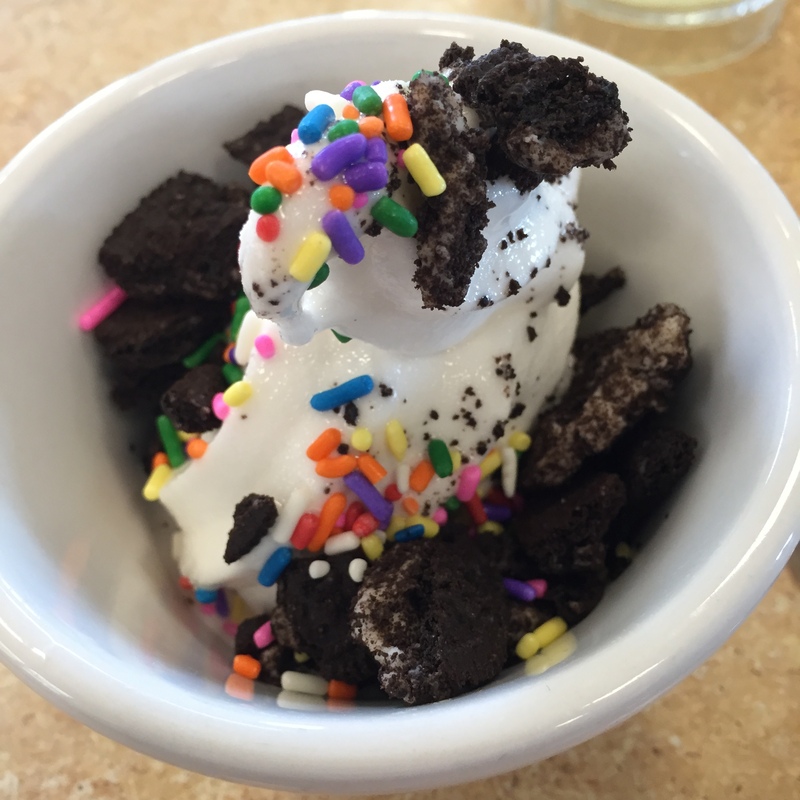 There was even a sundae bar! I am really pleased to be co-chairing a session with Alan C. Braddock on animal advocacy and the arts at the next College Art Association Conference in Washington D.C. I’ve included the call for papers for our session below. More details on the conference and how to apply can be found on the College Art Association’s Official Call for Participation. Please share widely. Today nonhuman animals figure more prominently in cultural, ethical, and scientific inquiry than ever before, thanks to recent research that has forced a significant reassessment of human exceptionalism, or speciesism. Lately some art historians have begun to consider these issues as well. All of this has taken place amid growing popular fascination with animals and backlash against their egregious, often concealed abuse in factory farming, entertainment, laboratories, and other areas. Animals have become subjects of vision, imagination, and activism—but also exploitation—like never before. This session examines the critical parameters of animal activism and advocacy in art since the eighteenth century. Papers should address important landmarks and historical contours of such art, assessing creative techniques used to advance particular goals. Consideration of why the discipline of art history has been slow to map this tradition and challenges involved in visualizing the interests of other beings are also encouraged. 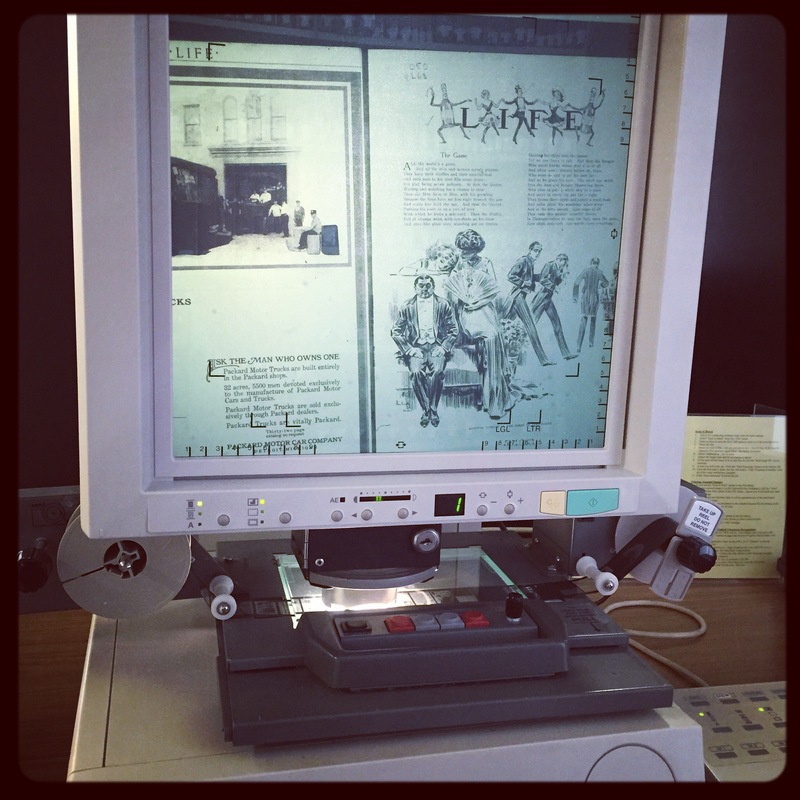 I’ve been spending some time in the library, working with old newspapers on microfilm. It has been many years since I’ve used a microfilm reader and it took me longer than I care to admit to get the thing up and running the first time. In my defence, there was a bit of a connectivity issue between the reader and the computer that scans and saves pdf versions of the pages. (I don’t recall this additional bit of technology from the last time I used a microfilm reader!) I was very grateful to the staff at the James A. Gibson library at Brock for helping me get this sorted. I love reading old newspapers. They are so interesting and so bizarre. I often get distracted by the ads and articles other than the ones I am trying to track down. In some ways it is kind of like I’m playing with a time machine!